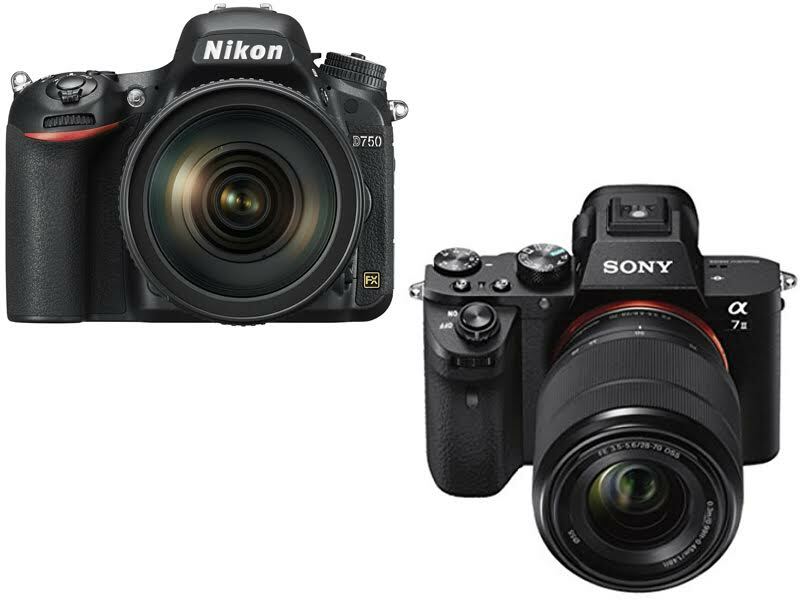 We are going to compare two cameras with different body types: Nikon D750 vs Sony A7II, both are Semi-Pro DSLR camera with a 24.0MP Full frame sensor. Let’s take a look at features of Nikon D750 and Sony A7 II. There you go. Sony has taken their line of full-frame cameras to the next level with the Alpha a7II Mirrorless Digital Camera with FE 28-70mm f/3.5-5.6 OSS Lens, which features 5-axis SteadyShot INSIDE image stabilization with 4.5 stops of compensation for pitch, yaw, horizontal shift, vertical shift, and roll. Operation of the 24.3-megapixel series has been streamlined with a redesigned grip, shutter release button, and customizable controls. The a7II also features a moisture- and dust-resistant design with a magnesium alloy body and a more robust lens mount. And, with refined algorithms and better utilization of the BIONZ X image processor, the a7II has an enhanced Fast Hybrid AF system that is about 30% faster than the previous model along with a 5 fps burst rate with continuous autofocus as well as a 40% faster start time. The 24.3-megapixel sensor enables high resolution images and low light effectiveness with its standard ISO sensitivity range of 100-25600. Both Sony A7 II and Nikon D750 have Full frame sized 24.0 MP resolution sensors so sensor size and resolution is not a differentiator between these two cameras. But, talking about number of available lenses is a big decision factor while choosing your interchangeable lens camera. When we look at the available lenses for these two cameras, we see that Nikon D750 has an advantage over Sony A7 II There are 274 lenses for Nikon D750’s Nikon F mount, on the other hand there are only 65 lenses for Sony A7 II’s Sony E (NEX) lens mount.